BAE Systems said Jan. 2 that it has completed the sale of its San Francisco Ship Repair business to Puglia Engineering, a Tacoma, Washington-based vessel repair company operating two shipyards in Washington State and one near Oakland. The sum of the transaction was not disclosed. The San Francisco yard offers maintenance, alteration and repair services to cruise liners from Alaskan and Mexican trade routes, trans-Alaska pipeline tankers, military support vessels, local bay traffic, bulk carriers and container ships. “We believe this divestiture is in the best interests of the San Francisco shipyard employees and both companies, as it will better position the San Francisco Ship Repair business with a parent company that has access to broader markets,” said Erwin Bieber, President of BAE Systems’ Platforms & Services sector. Puglia Engineering operates shipyards in Tacoma, Washington; Bellingham, Washington and Alameda, California, near Oakland. BAE Systems provides ship repair, maintenance, modernization, conversion, and overhaul services for the US Navy, other government agencies and select commercial customers, and operates six full-service shipyards in Alabama, California, Florida, Hawaii and Virginia. The Port of Portland on Jan. 4 filed a lawsuit in US District Court in Oregon against multinational agrochemical and agricultural biotechnology company Monsanto for what the port calls widespread chemical contamination impacting port properties. Monsanto was the sole manufacturer of polychlorinated biphenyl, an organic chlorine compound commonly known as PCBs, from 1935 until they were banned by the federal government in 1979. Despite the ban, they remain in the environment, and are associated with extensive human health impacts, including cancer and damage to immune, reproductive and endocrine systems. PCBs were widely used in industrial and commercial businesses and are found in paint and caulk, in electric transformers and capacitors, in wire and cable coatings, and in coolants, sealants and lubricants. PCBs are the primary contaminants driving cleanup in the Lower Willamette River and the Portland Harbor Superfund site. The Port of Portland says it has invested millions of dollars studying the legacy contamination in and along the Willamette River and Portland Harbor. However, the port says the impact of PCB contamination is broader than the Superfund site, including McBride Slough at Portland International Airport. The Port of Portland claims to have evidence that Monsanto became aware of how toxic and dangerous PCBs were while they manufactured their PCB containing products, and that they concealed that information. “Any decision to conceal facts about human health should have consequences,” Curtis Robinhold, the Port of Portland’s deputy executive director, said. “Monsanto reaped huge profits from the manufacture and sale of PCBs, and it is entirely appropriate for those faced with the cost of cleaning up this contamination to hold them accountable.” The US District Court case number is 17-cv-00015. The port is represented by the law firm of Baron & Budd, P.C. and Gomez Trial Attorneys, which also represent the cities of Portland, Seattle, Spokane, Wash., San Jose, Calif., Oakland, Berkeley, Calif., Long Beach, Calif., San Diego, and the State of Washington. The Port of Vancouver USA has won an IHS Dredging and Port Construction Innovation Award for a project creating new rail entrance into the port. The port said Jan. 4 that its trench project was selected over projects at Port Miami and DP World London Gateway to win this prestigious industry award, which was presented at a ceremony in London. The Vancouver USA trench is a new east-west rail entrance that eliminates conflicts with north-south rail traffic by bringing trains under the 1908 Columbia River railroad bridge. The structure, which is watertight and sits atop more than 410 steel pilings embedded in the river’s north bank, is the cornerstone of the port’s $275 million West Vancouver Freight Access project. The WVFA project is a concerted effort by the port to invest in its freight rail infrastructure. 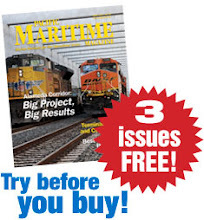 It consists of 21 individual projects to improve the ability to move freight not only through the port but also along the BNSF Railway and Union Pacific Railroad mainlines connecting the Pacific Northwest to major rail hubs throughout North America. “I couldn’t be more proud of our project and the hard work of everyone involved,” port interim CEO Julianna Marler said. “This is a very unique and innovative structure with benefits that stretch far beyond the port’s borders.” The trench was completed in August 2015. General Dynamics NASSCO has christened the Liberty, the third ECO Class tanker under contract with Florida-based customer SEA-Vista LLC. On Dec. 17, Debora Denning, wife of SEACOR vice president Tom Denning, christened the ship with the traditional break of a champagne bottle on the side of the hull. The 610-foot-long, 50,000 deadweight ton, LNG-conversion-ready ECO Class tanker is designed for fuel efficiency, and NASSCO has said it symbolizes the emerging direction of the shipping industry in the U.S. toward cleaner modes of transporting product. The ship’s advanced “ECO” design achieves 33 percent increased fuel efficiency through several features, including a G-series MAN ME slow-speed main engine and an optimized hull form. The Liberty is part of an eight-tanker program for two separate customers. “It’s been a busy and historic year for NASSCO,” company Vice President and General Manager Kevin Graney said. NASSCO is the only major shipyard on the American West Coast conducting design, new construction and repair of commercial and US Navy ships. In the past decade, the company delivered 30 ocean-going ships to government and commercial customers – including the world’s first LNG-powered containerships. Maintenance dredging of the Port of Redwood City’s shipping channel has been completed, thus restoring the channel to its authorized depth of minus-30 feet for the first time in almost two years, the port said in late December. Maintaining the full depth allows ocean carriers to bring in fuller and more economic loads of cargo needed for construction in the San Francisco Bay/Silicon Valley area, while also facilitating the recycling of scrap metal by exporting to Asia. The bigger Panamax ships serving the Port of Redwood City and the construction of roads and buildings in the region, require a dependably dredged channel to assure efficient operation. Dredging, which was performed under the auspices of the US Army Corps of Engineers, was complete in mid-December. Maintaining and improving America’s marine navigation network is the responsibility of the Army Corps of Engineers, utilizing funds generated by the Harbor Maintenance Tax paid by importers. Each year the Corps of Engineers and US Congress determine how to allocate these limited funds among the hundreds of navigation projects nationwide. The port says that in 2016, US Senator Diane Feinstein (D-CA) and Rep. Jackie Speier (D-San Francisco) were instrumental in helping secure $7.9 million in funding for the just completed channel dredging.